However, the latest official release, version 0.5.0, does not yet support the R programming language. Fortunately NFLabs, the company driving this open source project, pointed me this pull request that provides an R Interpreter. An Interpreter is a plug-in which enables zeppelin users to use a specific language/data-processing-backend. 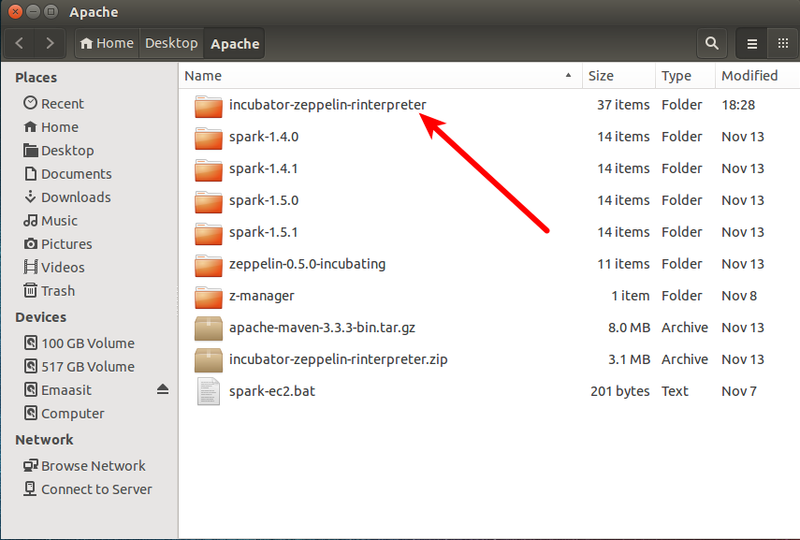 For example to use scala code in Zeppelin, you need a spark interpreter. 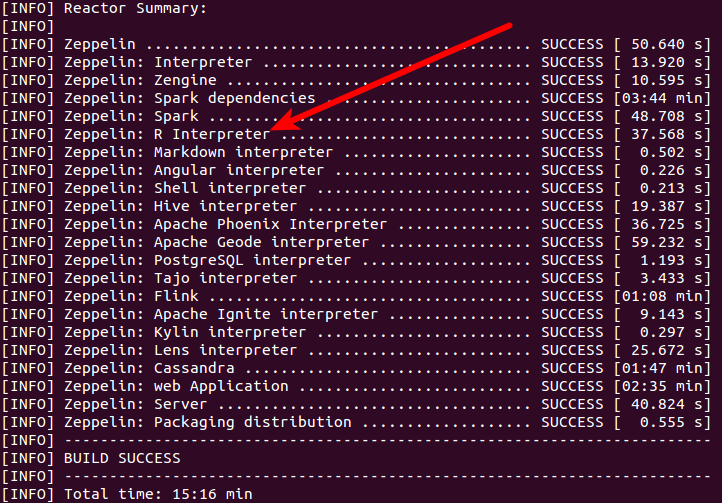 So, if you are impatient like I am for R-integration into Zeppelin, this tutorial will show you how to setup Zeppelin for use with R by building from source. We will launch Zeppelin through Bash shell on Linux. If you are using Windows OS I recommend that you install and use the Cygwin terminal (It provides functionality similar to a Linux distribution on Windows). Make sure Java 1.7 and Maven 3.2.x are installed on your host machine and their environment variables are set. Run the following code in your terminal to build zeppelin on your host machine in local mode. If you are installing on a cluster then add these options found in the Zeppelin documentation. This will take around 6 minutes to build zeppelin, Spark and all interpreters including R, Markdown, Hive, Shell, and others. (as shown in the image below). Run the following command to start zeppelin. Go to localhost on your web browser and listen on port 8080. (i.e. http://localhost:8080). 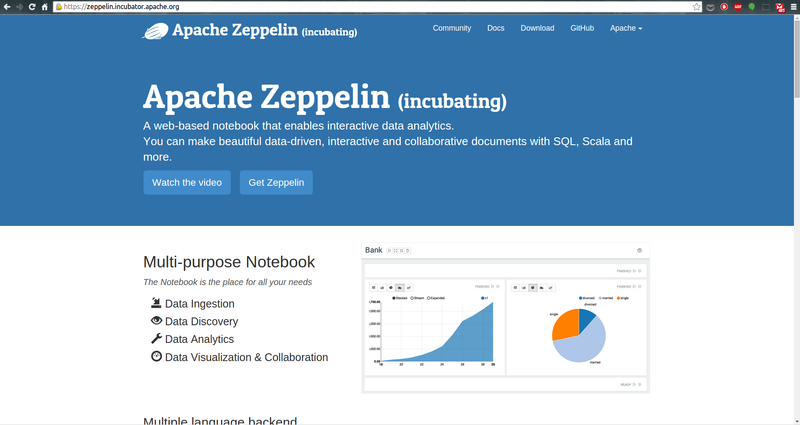 At this point you are ready to start creating interactive notebooks with code and graphs in Zeppelin. Click the dropdown arrow next to the “Notebook” page and click “Create new note”. Give your notebook a name or you can use the assigned default name. I named mine “Base R in Apache Zeppelin”. 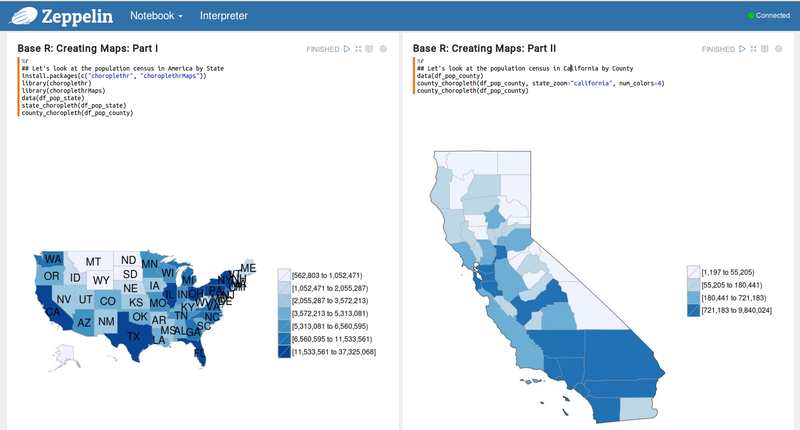 To use R, use the “%spark.r” or “%spark.knitr” tags as shown in the images below. First let’s use markdown to write some instruction text. Now let’s install some packages that we may need for our analysis. Now let’s read in our data set. We shall use the “flights” dataset which shows flights departing New York in 2013. 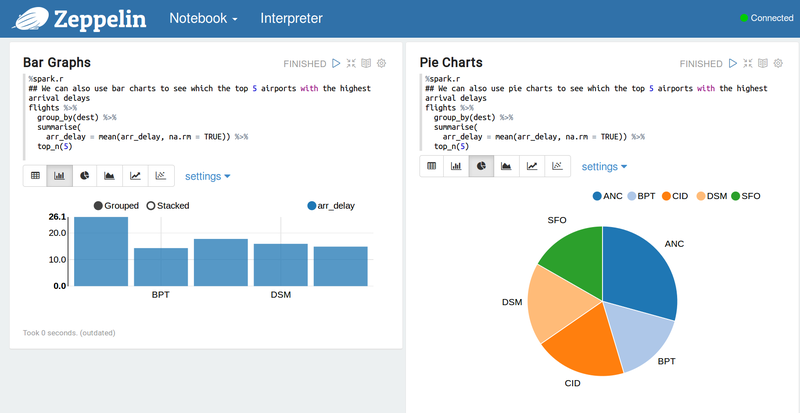 You can also use bar graphs and pie charts to visualize some descriptive statistics from your data. 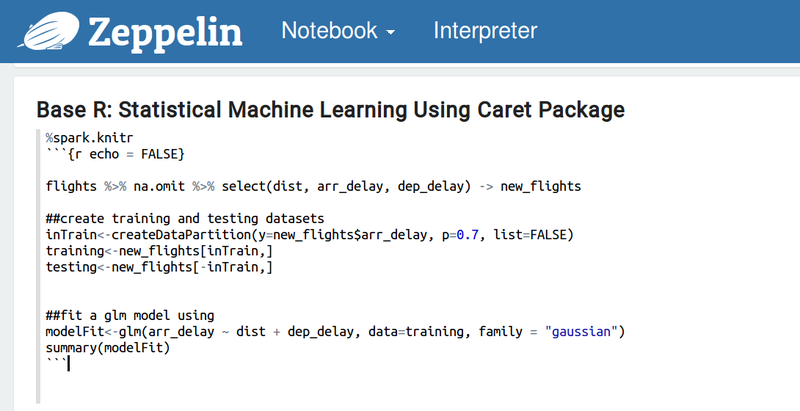 Now let’s do some statistical machine learning using the caret package. How about creating some maps. 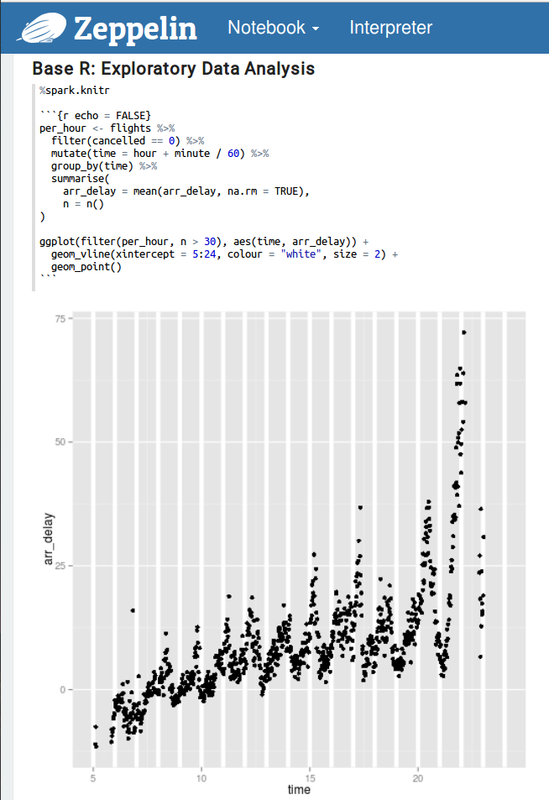 Zeppelin allows you to create interactive documents with beautiful graphs using multiple programming languages. 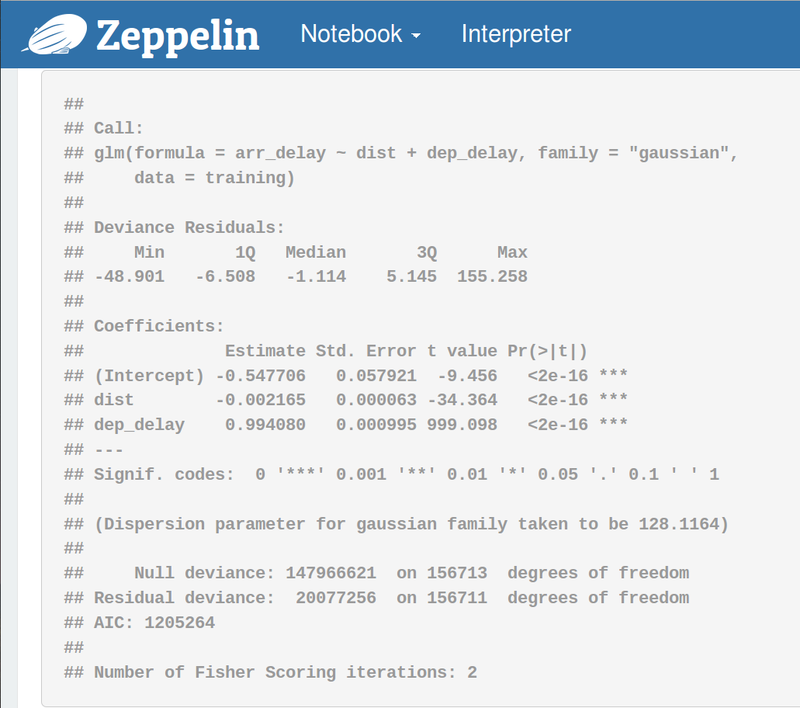 The objective of this post was to help you setup Zeppelin for use with the R programming language. Hopefully the Project Management Committees (PMC) of this wonderful open source project can release the next version with an R interpreter. 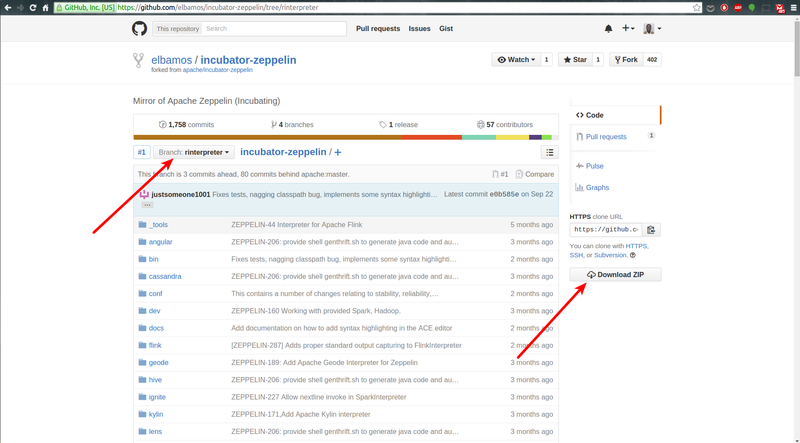 It will surely make it easier to launch Zeppelin faster without having to build from source. Also it’s worth mentioning that there is another R interpreter for Zeppelin produced by the folks at Data Layer. 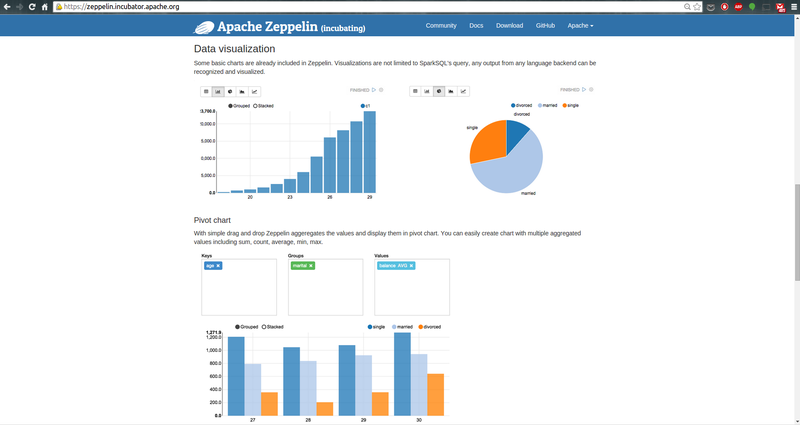 You can find instructions on how to use it here: https://github.com/datalayer/zeppelin-R-interpreter. Try out both interpreters and share your experiences in the comments section below. 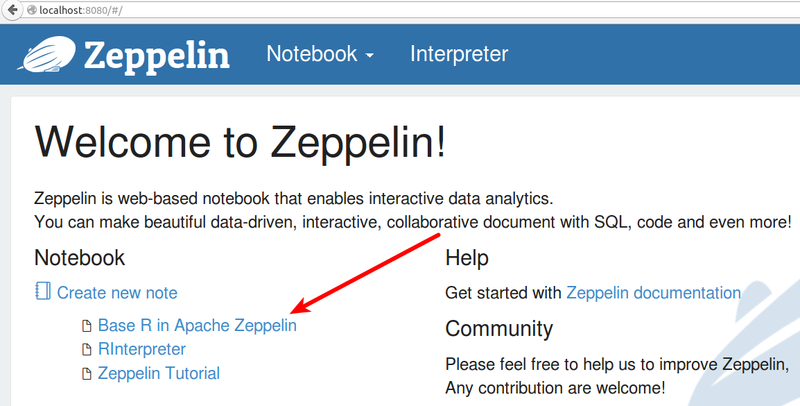 As a follow-up to this post, We shall see how to use Apache Spark (especially SparkR) within Zeppelin in the next blog post. To leave a comment for the author, please follow the link and comment on their blog: SparkIQ Labs Blog » R.